Charleston is known for its incredible food scene, and Sullivan’s Island is no different. The beautiful beach town is home to some of the area’s best restaurants, from barbeque joints to buzzy brunch spots. In no particular order, these are the best restaurants on Sullivan’s Island, SC! If you’re looking for more things to do during your trip, take a look at our free Vacation Guide. We’ve included dozens of recommendations on outdoor activities, shopping, upcoming events, and more. All of the restaurants below can get very busy. If you have a large group, we recommend arriving early or calling ahead (some places don’t take reservations). During popular times such as weekend evenings, expect to wait. Fortunately, all of these places have great bars where you can grab a drink in the meantime! The ambiance, memorable food, and freshly-squeezed drinks at The Obstinate Daughter make for a truly wonderful dining experience. The space is elegant yet cozy and is complemented by beautiful nautical decor. You can’t go wrong with anything on the menu, but the pizzas and pasta are always a crowd favorite. The Obstinate Daughter is also open for brunch! For all meals, we highly recommend making a reservation. Home Team BBQ has three locations in the Charleston area that are always packed. Just minutes from the beach, the Sullivan’s Island location is our favorite! Enjoy delicious barbeque and other Southern fare in a casual and lively atmosphere. This is a great place to eat after a day at the beach. If you’re interested in a refreshing drink, you have to try one of their legendary frozen Game Changers! Mex 1 Coastal Cantina offers fresh and flavorful Southwestern-style Mexican food, delicious margaritas, and ice cold beer. The authentic flavors and coastal vibes might have you mistaking your location for the Baja California coast! With frequent live music on the weekends, Mex 1 is a fun and energetic place to hang out. Named in honor of famous American writer Edgar Allan Poe, Poe’s Tavern is best known for its burgers and beer. The eclectic spot is full of Poe-inspired decor that perfectly compliments the pub-style fare. Come for the burgers and stay for the drinks, good vibes, and people watching! The Sullivan’s Island CO-OP is a gourmet market, cafe, and deli that serves wonderful sandwiches, local coffee, and Charleston’s best frosé. Opening every day at 7:00 a.m., the CO-OP is the perfect place to enjoy a delicious breakfast. If you’re on island time, don’t worry, because breakfast is served all day! One of the best parts about vacationing is getting to try the local cuisine! In an area like Charleston, there are wonderful restaurants and bars around every corner. Take a look at our guide on Isle of Palms restaurants for more outstanding places to dine. If you’re looking for a fabulous spot to enjoy a drink after dinner, one of these Isle of Palms bars will do the trick. 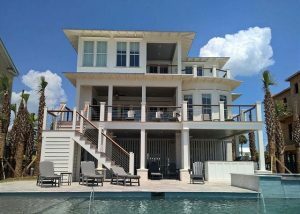 East Islands Rentals is your premier choice for vacation rentals in the Charleston area. With an East Islands vacation rental, you can enjoy convenient access to all the best activities, attractions, and restaurants on Sullivan’s Island, SC and the surrounding area. Afterward, come back to the comfort and luxury of your vacation home. Many of our rentals are oceanfront and offer private pools! Ready to experience all that our area has to offer? Book your perfect vacation home today and start planning the ultimate trip. We look forward to hosting you soon!